This document provides some everyday events that can be used to help students develop a conceptual understanding of addition and subtraction of integers. Also, it shows how teachers can use number lines, two-sided counters, and linking cubes to assist in understanding of adding/subtracting integers. This unit was developed by the GA Dept of Education as a part of their 7th Grade CCSS Aligned Curriculum. You may visit their site for the rest of the curriculum documents, here. This ppt was developed to help teachers see different ways to teach operations with integers. This presentation will be updated again, soon. Please check back again. 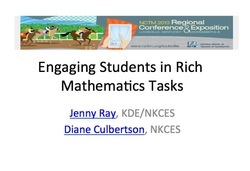 Presented at KEDC's Summer Mathematics Leadership Netwok Meeting. 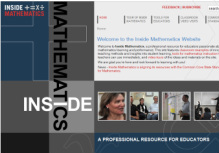 Session was designed for math teachers in grades 8-12. This is an excerpt from an EXCELLENT website that has numerous lessons for teaching the mathematical standards (content and practice). For the shortened PowerPoint Presentation that shows what it looks like to teach congruence and similarity in the way the CCSS/KCAS intened, please click, here. To be redirected to the website that includes a video clip of a student working through a problem and for downloadable lesson resources, please click, here. These units of instruction were developed in June 2012 by the GA DoE are aligned to the Common Core mathematics standards. Developed in December 2011, the Common Core Standards Writing Team developed this companion document to explain, in depth, the progresion from grade 6 to grade 8 of probability and statistics. Click here for the link to more progressions documents. Developed in April 2012, the Common Core Standards Writing Team developed this companion document to explain, in depth, the progresion of the high school probability and statistics standards. Click here for the link to more progressions documents.